Bed Bugs Are Biting People on Airplanes. Never Leave the House Again -- Oh, Wait. There's a strong case to be made that the only thing worse than a trip to the airport is having bed bugs. So we're absolutely horrified to announce that these both these woes can now be experienced simultaneously. How is such a thing possible in a moral universe? We don't have time to get into that right now. We can, however, tell you that the hellish insects were found on the seats on a flight from Newark Liberty International Airport to India, as well as other Air India flights. "In one case this week a family complained their infant was covered in bites and bleeding by the time the 17-hour flight landed in Mumbia," Fox5NY reports. 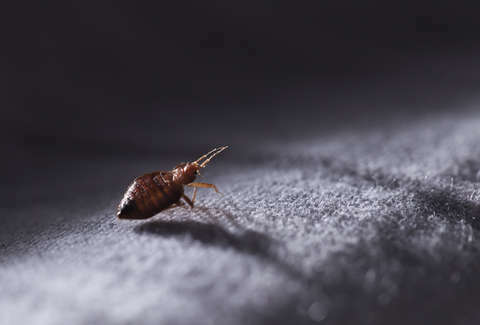 According to the Times of India, the national carrier received other complaints of bed bugs in business class earlier this week, "but it appears to have ignored them." As you can see below, others have tweeted complaints to the Air India about the infestation: "is this is what we paid $10,000 for???" one customer asked. Air India responded: "Your safety and pax comfort is paramount for #AirIndia. Inquiry was ordered on the same day, and responsibility will be fixed. We feel your pain and empathise also."